For the third week in succession I can report on a first harvest. This time the first harvest came from our Casablanca potatoes. Our first harvest of the week was on Wednesday - the day when we dug the first potatoes of the season. It wasn't a huge haul from the one root that was lifted but there were some immature tubers that would have continued to develop as the foliage is still growing strongly. This bed was always intended to provide early pickings for immediate use which is why they were planted without weed control fabric. 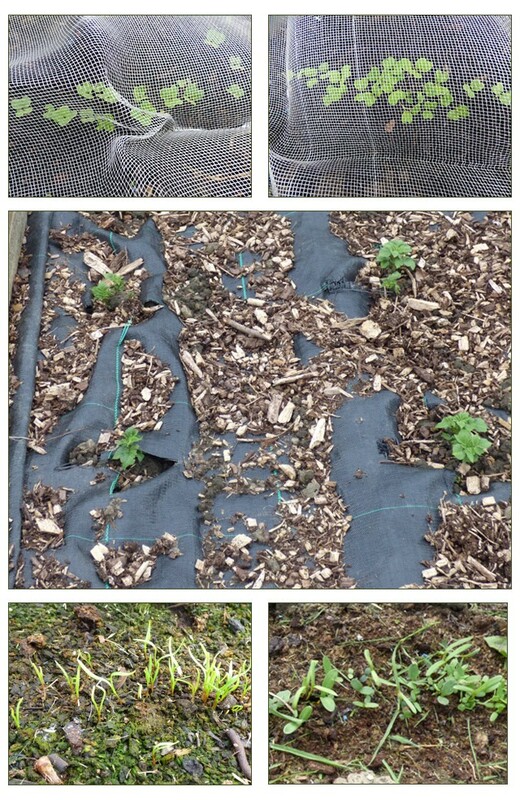 The strawberries were still battling on despite the weather and slug attack. The varieties that gave the best harvest on Wednesday were Elsanta, Vibrant and Cupid. This was quite surprising as Elsanta and Vibrant were the most disappointing in terms of plant growth with some plants dying away completely. This also meant we were left with fewer productive plants. I'll save some runners from these varieties to fill the gaps in their part of the bed. There were still plenty of green strawberries, I just hoped that they would survive - it's a rough world out on the allotment. 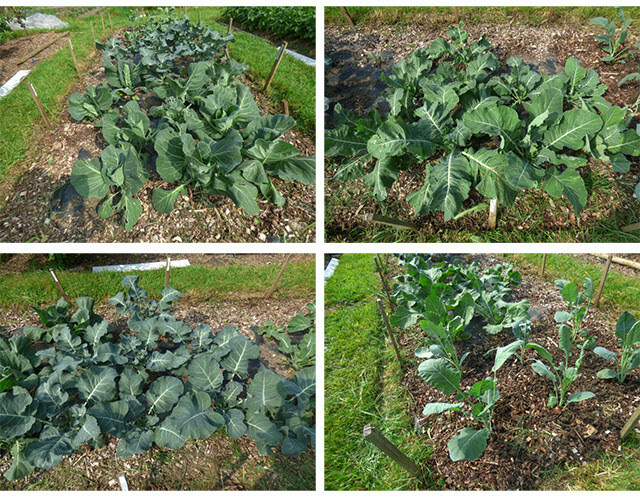 We picked more cabbage which had a bit of slug damage on the outer leaves but at least the mesh had protected them from devastation by wood pigeons and caterpillars. There is one batch of slug eggs that won't be boosting numbers and developing into munching machines. It's a sign of the inclement weather that eggs are being laid above ground. This cluster was under the enviromesh but is there no more. The second harvest of the week was on Sunday. The spells of sunshine seemed to kick start some of the varieties that had been slow to ripen earlier and we had a good harvest. Cupid was still one of the stars of the harvest. It tastes good too. We also dug a couple more roots of potatoes which produced more tubers than the first root. So far every tuber harvested has been free from any damage or nibbling. Two more cabbages were added to the harvest. There were no flowers in our first harvest as we were going away to Norfolk for a couple of days but I picked a few flowers on Sunday. Our main cut flowers at the moment are roses. I am also managing to pick a few of our meagre sweet Williams and I also cut a few campanula persicifolia. We have a few clumps that are looking lovely at present so I decided to see how they performed as cut flowers. We have continued to find gaps in the showery weather during which to work on the plot. Not only did things need to be planted but beds needed preparing for them. The seeds sown last week have come through quickly and have also germinated well. If the slugs leave them alone we will have some thinning out to do. The last potatoes to be planted are also pushing through. This year we covered the seed beds by just draping enviromesh over them rather than creating a 'tent'. Last year carrots grown in this way suffered less from slug attacks on young seedlings. It may have been a coincidence but we are repeating the method this year. There are gaps in the rows of seedlings but nothing like last year's complete annihilation. Other slug treats planted out were the low growing sunflowers - Music Box. These were the strongest looking young sunflower plants that we have ever grown but will they survive Slugmageddon? I also planted the last lot of annuals in mud! The earlier ones are growing but I always wonder at this stage whether I will eventually have a flower display. This year seems more in the lap of the gods than ever. We planted leeks which always look pathetic at this stage. Usually we are complaining that the soil is too dry and the holes made for the plantlets fills in before we can plant - not so this year! The sweet corn is also now in the ground in the necessary block formation to aid wind pollination. Once the flowers have formed I usually brush the plants with my hand each time I pass their bed as a little extra help. Some of the modules had two plants growing so these were split and planted separately. The garden and plot greenhouse now are planted up with as many tomatoes as they can comfortably accommodate so the remaining plants have been installed directly in the ground. Last year was blight free and the outdoor plants did very well. If blight hits we could have a wipe-out but as the plants would probably end up on the compost heap if not planted out we may as well take a chance. The winter brassica plants have been waiting patiently in the cold frame and are now planted on the plot protected under enviromesh. As you can see from the photos above most of our planting is through weed control fabric which I wish we had 'discovered' when we were still working - paid working that is - as it has greatly cut down on plot maintenance but the way we use it doesn't mean that we have no weeds in the covered beds. For some crops and for sowing rows of seeds, a channel is cut into the fabric and weed seedlings will germinate in the gaps as they will in any mulch used. Weeding these areas though tends to be quick and easy. Far easier than weeding under the fruit bushes after which I ended up with a large itchy bite on my neck. 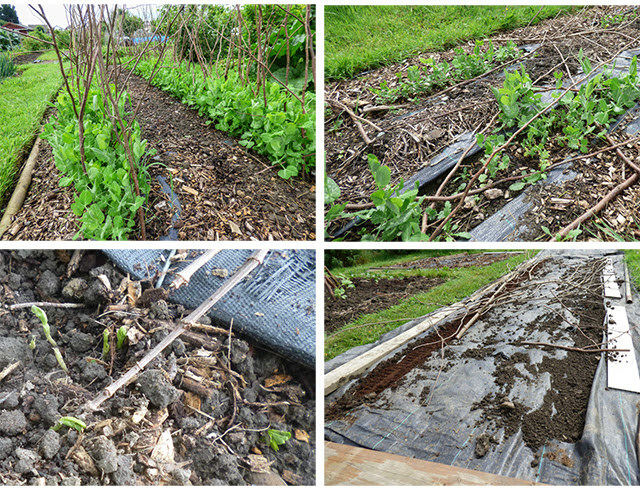 Usually I would just hoe any uncovered beds to remove the weeds but the soil is too wet. If anyone had asked, I would have said that everything was way behind this year but looking back we picked our first 'spring' cabbage last year on June 15. This year we picked our first on June 18 so they have matured at the same time. Also at this time last year we took home from the plot, strawberries, salad crops, roses and sweet Williams exactly the same things as we brought home last week. The strawberries are split up according to variety. 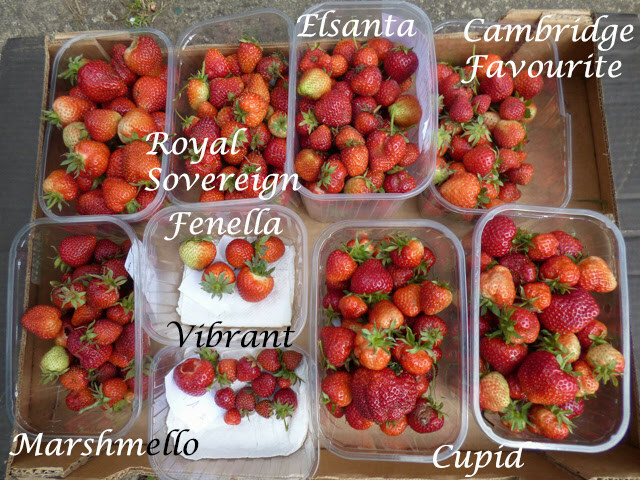 We picked Elsanta, Royal Sovereign, Marshmello, Vibrant and Cupid. Maybe we will carry out a taste test later but this lot all went into a couple of bowls together with some Greek yoghurt. The strawberries along with everything else needs a bit more sunshine (or at least brightness) and a lot less rain. Some of the strawberries had turned mushy and others had attracted the attentions of slugs. For this reason some are picked slightly under-ripe. They taste ripe in spite of the lack of redness. The spoiled berries need dealing with in different ways - the mushy ones need to be removed and disposed of but the nibbled ones are best left on the plant. Slugs will return to the site of an earlier meal and eat more of the same fruit. If you remove it they will start on another fruit close by. Every year the shrub roses on the plot start off with healthy looking leaves which quickly become covered in black spot but at least I can strip off the leaves and pick the flowers. The daisies in the vase above are the ones that I picked last week and were too good to throw away. I also picked a few stems of candytuft from the self sown carpet under the pear trees. The sweet Williams have been a disappointment this year. I left the ones that flowered last year as the new plants were poor. There is little difference between the two patches - if anything there are more flowers on the old plants. This year's wallflowers were equally disappointing. I sow the seeds in modules and transplant but this year I have decided to try direct sowing. Coincidentally Monty Don was doing just that on Gardeners' World last week. I did manage a small bunch but there won't be many more. We have been trying to get as much work done on the plot as the rain showers allow. There is a fine line between our soil becoming rock hard as too soggy and sticky to work with. We took advantage of the fine line by preparing and planting up as many of the remaining empty beds. Now we have crossed into wet and soggy again and so more planting is on hold. The last lot of potatoes have been planted. On our last plot visit all the other potatoes were growing well and some had started to form flower buds. Since then we have had blight conditions so who knows what these will look like on our next visit. At least those tucked underground should be safe. We planted the second batch of broad beans just as the first batch are in flower. They have battled through the weevil damage and it remains to be seen whether this second batch which are a shorter variety - Robin Hood - will also be attacked by voracious weevils. Despite their name the pea and bean weevils don't touch the runner or climbing French beans. Their battle is with the slugs. We decided to dedicate one bed to odds and ends. So far we have planted some left over runner and climbing French beans, some broad beans that wouldn't fit in the designated bed, chrysanthemums and dahlias that overwintered in the greenhouses and some self sown annual scabious. We sowed another two rows of peas. The first lot are just peeping through so another lot has been sown. The first sowing is growing away well although there are no signs of flowers just yet. This sowing grew fast enough to shake off the weevil damage but this wasn't the case with the mangetout and sugarsnaps. At best they can be described as patchy. Thanks to the weevils any crop is likely to be small. Let's hope that the weevils leave the latest sowings alone. In the photo on the bottom right above, the 'trench' on the left has been sown with mixed annual flower seeds but more on that at a later date. Soon after we planted a brassica bed, the cauliflowers were besieged by slugs and it appeared that their days were numbered so we bought some young Romanseco plants to replace them. These were growing on in pots - the idea being that larger plants had more chance of survival. These have now been planted out alongside the original cauliflowers that have rallied. The mesh has been replaced to protect against the ever watchful wood pigeons and ever hopeful white butterflies. We use mesh rather than netting in an attempt to reduce aphid and whitefly infestation. This year the slugs homed in on our newly germinated parsnip seedlings. I tried resowing but we have only been left with patches of remaining seedlings and so are not expecting a good harvest. The carrots have fared better. This year the enviromesh has just been draped over rather than made into a sort of tent. 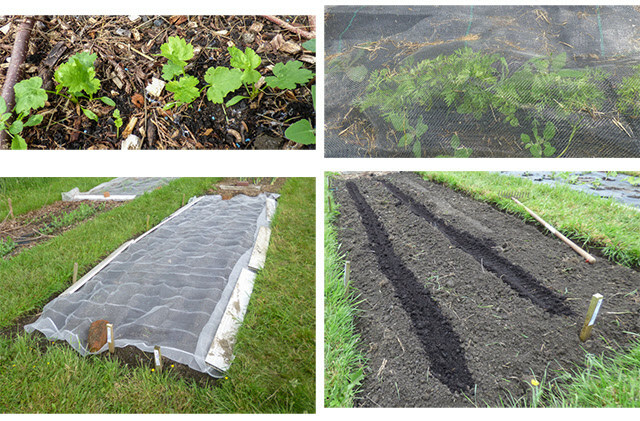 I wondered last year whether this method worked better as the slugs had less open access to the seedling. Whether or not this is true is unproven but the carrots have had a better survival rate this year. We have sown swede, turnip, beetroot, spinach and more carrots in another bed. We had also sown all except carrots earlier in modules but whether the slugs will leave any to be planted out remains to be seen. We planted out the Crown Prince squash and the courgettes. Finally, we have netted the strawberries with a softer netting which we are hoping will be easier to handle when removing it for harvesting. The previously used netting easily tangled including around our feet creating a trip hazard. All we need now is less wet, mould and slug encouraging weather and more berry ripening sunshine. Last week we had a special event. Neither of us celebrated a special birthday but our landmark event is one that many gardeners will relate to, we picked our first strawberries of the season! Our Cambridge Favourites were the first to produce a few ripe fruits. 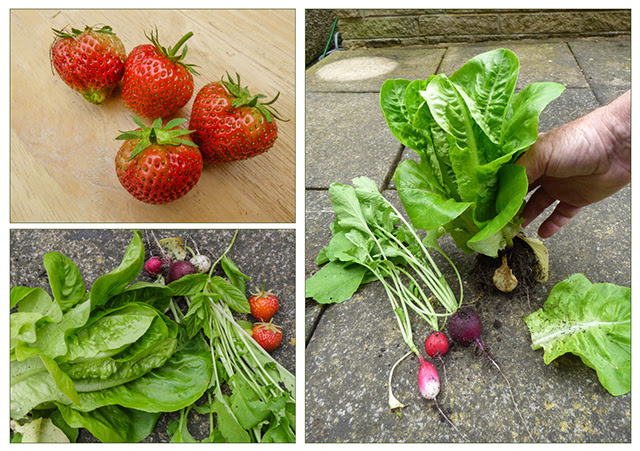 We have been picking salad and herb crops regularly from the raised bed and tubs in the garden but the strawberries were the first of our allotment food crops. We can now only hope that the weather doesn't spoil things as it is providing ideal conditions for growing strawberry mould and encouraging the spread of potato blight and slug activity. Although this was our first food harvest, we have been picking cut flowers for a while. The sweet rocket and perennial cornflowers are beginning to fade but the roses are taking over. I cut the roses when in bud to prolong the vase life. The shrub rose above is Jacqueline du Pre which like the others on the plot has a lovely rose scent. At the moment the motorway and roundabout verges look to be covered in drifts of snow as the ox eyed or dog daisies are in full flower. I like them so much that I have planted a clump on the plot. The insects love them too. They not only look good and provide good photography subjects but also are long lasting cut flowers. There is one thing to watch out for stowaways that you certainly don't want to take into the house. This interloper was no doubt after the honeydew created by the aphids. It's a pity that they don't eat the aphids too.